Paneer, a storehouse of protein and calcium!! It has high biological value protein. It’s soft, succulent texture and ability to lend itself to any taste is astounding. In this section you will learn how to make low fat paneer to save on those extra calories and fat and use it to make a variety of subzis like Coloured Capsicum and Paneer Subzi, Cauliflower Paneer Subzi, Paneer Lababdar and many more…. A few more interesting ways to use this low-fat paneer is to make healthy steamed koftas and simmer in gravies as done in Healthy Koftas in Makhani Gravy where the gravy is made up of healthful pumpkin and low fat milk is used instead of cream. Try this classic recipe of Paneer Methi Palak to topup your protein, fibre and vitamin A levels. Shahi Paneer Mutter a healthier version of a rich and royal recipe with slight modifications in the ingredient to increase its nutritive value. You can even use paneer as a stuffing to make Stuffed Bhindi with Paneer as other recipes commonly use chana flour or masalas for stuffing. By adding paneer in bhindi as a stuffing you increase the nutritive value of the subzi. Go ahead and enjoy these healthy mouth-watering delicacies. The Coloured Capsicum and Paneer Subzi has a combination of colorful bell peppers to give a boost of anti-oxidants to your body. 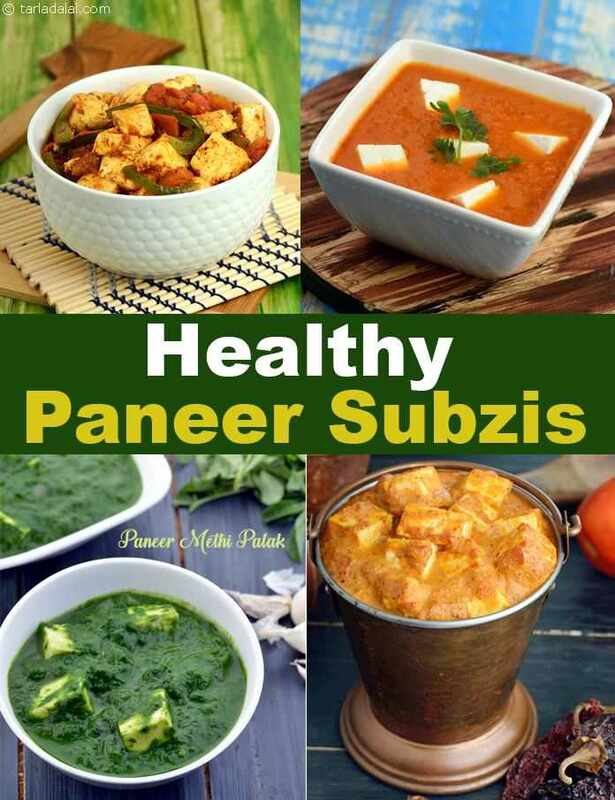 Enjoy our collection of Healthy Paneer Subzi recipes and Healthy Subzi articles below. Nice creamy treat for taste buds and also nutritious.